Wine tasting with good girlfriends is one of my favorite Pacific Northwest sports. You get to pick your teammates, there isn’t much of a warm-up needed, and in the end, everyone walks away a happy winner. As a longtime Oregonian with about 20 years of wine tasting under my belt, I’ve accumulated a lengthy list of must-visit Oregon wineries. So when Expedia, my go-to travel planning site, approached me to share some of my favorite Oregon wineries to visit on a girls’ wine tasting weekend, I was ecstatic. Because every Urban Bliss mom/woman/wine drinker needs a good group of girlfriends to go wine tasting with. And every group of girlfriends needs a solid itinerary of reliable wineries where they can kick back and relax. I got yo back, girlfriends! With more than 900 vineyards producing 72 varieties of grapes, more than 600 wineries, and 18 approved wine growing regions, narrowing down an Oregon wine tasting itinerary may seem daunting. I’ve compiled a list of wineries that I’ve personally visited with my own besties and have loved. Most of them have larger tasting rooms and/or private tasting rooms for small groups, beautiful views, outdoor seating, awesome friendly staff, and vineyard tours. Located approximately 45 minutes east of downtown Portland, Oregon, in the heart of the scenic Columbia Gorge, is the maker of what is currently my favorite Oregon Pinot Noir: Phelps Creek Vineyards. Phelps Creek offers you and your friends breathtaking views, masterfully crafted Pinot Noir and Chardonnay, and two fabulous tour options as well as custom group wine tasting options. Tour: Ultimate Wine Country Experience ($80/person or $440 for 6 people) – a welcoming tour guide takes you and your friends through the vineyard, sharing the history of Phelps Creek while tasting different wines; you’ll drive up to the cellar, where you can sample young wines from the barrel; and you’ll end at the crush pad where you will be treated with the most beautiful views overlooking Hood River valley, and taste current release wines paired with locally-sourced food. Tasting Fee: $10 for the daily flight of red, white, and dessert wines. Tasting fee is waived with wine purchase. 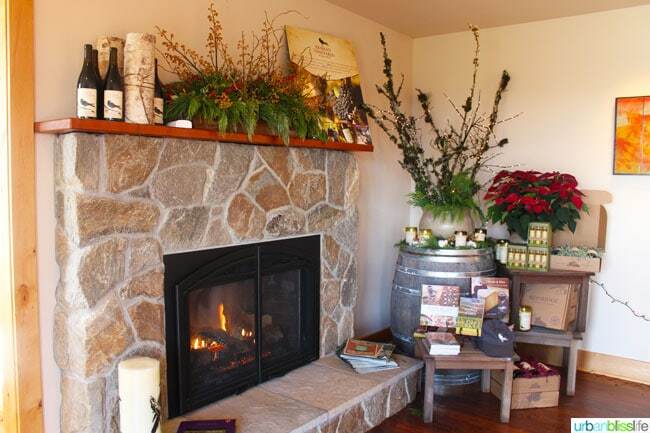 One of the many wineries located in the Dundee Hills of Yamhill County wine country, is Sokol Blosser Winery. The new sustainable tasting room built in 2013 offers ample, beautiful space for you and your friends to enjoy your wine tasting experience. Sokol Blosser offers a variety of tasting options and experiences, including a picnic by the vines, a winery Pinot experience, and summer vineyard hike. Cellar Club members also have access to the super cool club room downstairs, which is an excellent spot to enjoy a more intimate, private wine tasting experience with your girlfriends. Slightly off the high occupancy Dundee wine path in Carlton, Oregon, is the picturesque Mineral Springs Ranch. The 240 acre woodland and graze land is home to Soter Vineyards, with a large, open tasting room fashioned like a modern farmhouse that opens out to beautiful views of the property. Because they are only open by appointment for private or semi-private tasting experiences, Soter Vineyards offers you and your group of girlfriends a highly personal wine tasting experience, with the full attention of the amazing Soter Vineyards staff. You are allowed to sit back, relax with your friends, and enjoy your time there without feeling rushed, without brushing elbows with strangers, and without worrying about whether your group is talking and laughing too loudly. Soter Vineyards offers semi-private tastings daily at 11am, 1pm, and 3pm, with advanced reservations. What to Drink: If you’re feeling decadent, get the 2007 Proprietary Red Napa Valley ($125). For every day wine, the 2013 North Valley Pinot Noir ($35) is a delicious choice. Tasting fee: $25 per person; fee is waived with purchase of one bottle per tasting fee. When you visit Red Ridge Farms, you get three fabulous spots in one property: Red Ridge Farm & Stonycrest Cottage lodging, Oregon Olive Mill, and Durant Vineyards. Whether you plan to stay overnight, host an event in their beautiful event space, or simply stop by for an hour or two for a wine tasting or olive oil tasting, Red Ridge Farms offers so much for you and your group of girlfriends that you are sure to find something for everyone to enjoy here. Olive Mill Tours and private tastings require at least a week’s advance notice. Tours are free with advanced reservation, and tasting tours range from $20/person to $55/person. The tasting room is cozy but spacious enough to give your group some elbow room. Snag the separate semi-private room behind the tasting bar, where you and your girlfriends can relax around a large farmhouse table and sip wines by a roaring fire. If you have a few hours, and want to enjoy a relaxing wine country experience, I highly suggest visiting Keeler Estate Vineyards. Their tasting room just opened to the public in May of this year. Located in Amity, Oregon, Keeler Estate Vineyard occupies 200 acres of diverse landscape that consists mainly of Pinot Noir and Pinot Gris grapes, although they also have Chardonnay and are about to release a fabulous Rosé. Take the full tour with owner Gabriel Keeler and experience the many gorgeous property gardens, ponds, wildlife, bees, and overlook area. With ample standing and sitting space inside and outside of the tasting room, guests are encouraged to roam the full property while tasting wines. What to Drink: if it’s available when you go, try their Rosé. If not, try the 2012 Pinot Gris. Tasting Fee: $15 per person; $10 is waived with the purchase of two bottles. With some pre-planning, a wine tasting weekend in scenic Oregon wine country can be a fun way to recharge and reconnect with dear girlfriends. It’s a great time to let loose, set aside expectations, and go with the flow. Remember to taste, not chug — and don’t be afraid of pouring excess wine after tasting into the spit bucket. Pack and drink lots and lots of water. Bring extra crackers, hard cheeses, nuts, and shelf-stable meat in a cooler. Wear comfortable shoes for wine tours. Vineyards are farmland, after all, with lots of dirt and uneven terrain in some areas. Assign a designated driver or, even better, have everyone chip in for a limo. Go big or go home, right? For more wine tasting tips, visit my Oregon Wine Tasting Tips for newbies. I wrote this post in partnership with Expedia. All opinions and photos are, as always, my own. i adore sokol blosser but haven’t visited the rest of these! awesome suggestions for my next trip out there! Hope you get a chance to check out the other wineries too, Kelsey! I am due for another trip to Sokol Blosser again myself. Oh, Sokol Blosser is my FAVORITE! I really should get back down there soon…..
Sokol Blosser is so great, isn’t it? I love their Evolution wines. Thanks for pinning, Susannah! When my kids were babies, I would still go wine tasting. Even though I didn’t partake in the wine, it was still so lovely to walk around the vineyards with good friends & my hubby! I’ve been craving a weekend like this, thanks for sharing! And the photos are extra gorgeous today! You deserve a weekend in wine country with friends, Meredith! What great places! I haven’t been to a few of these like Keeler, it looks beautiful. I definitely need to add it to the list! I agree with the tips, I always forget extra snacks and then am so jealous of those people who have brought themselves a picnic! Keeler is brand new, Erin! They just opened to the public a few weeks ago :) I’ve already been twice — it’s that amazing! My friends and I go out to wine country often! You have some new names on your list I must try!! Aren’t days with your friends just the best. I love this! They really are the best, and we’re so lucky to be able to enjoy time with good friends in such a beautiful state! Because you should always end a trip to wine country with dates on the calendar for your next wine country outing, Pech! Totally bookmarking this post! I’ve been trying wine more often than cocktails lately and i think I’m finally developing a taste for it. My husband and I were just talking the other day about doing a wine tasting so we’ll have to start with these! If you do go to any of them, I’d love to hear how you liked them! Cheers, Sarah! It seems that all of you had a great time in your wine tasting activity and I can’t blame you because it’s really a fun thing to do. In fact, my friends and I had already try it and we are more willing to try it again. Thanks for sharing all your experience. Love this post. Thinking of visiting Oregon wine country for a weekend for the first time with a group of around 7 couples . We wanted to rent a vacation home that could accommodate all of us. What city do you recommend as a homebase? Thanks!